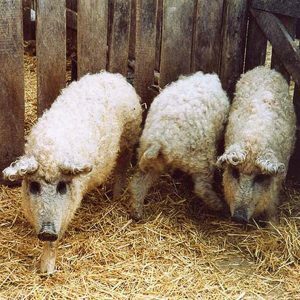 The Mangalica pig breed (also called Mangaliza or Mangalitsa) was once found across Hungary and in bordering countries, particularly Romania. The corpulent Mangalica grows very slowly and cannot be kept in closed quarters. It is therefore poorly suited to modern industrial pig farms, and it has been gradually replaced by modern breeds. After almost disappearing completely, the breed was rediscovered in the late nineties thanks to its excellent meat characterized by a high fat content, but low cholesterol. The breeding of pigs mangalica thus became a profitable business, even outside the area. The same producers who had to protect the breed have now endorsed the breeding of pigs crossed with the most common large white, giving rise to a breed able to achieve the necessary weight for slaughter in 8-10 months, instead of the traditional 18- 24 months. The pig is distinguished by its rich and curly coat, which is usually blond, sometimes black, and occasionally red. On the Hungarian plains, farmers raise Mangalica pigs free-range and feed them a mix of wild pasture, supplemented with potatoes and pumpkins produced on the farm. This flavorful pork can be braised slowly in the oven or cooked in stock. Sauerkraut, potatoes, and stuffed peppers are the usual accompaniments. Mangalica breeders also cure their own smoked hams and sausages according to traditional techniques. The sausage, the primary product made from this pig, is produced in various forms and sizes, but the most traditional type is packed in the pig’s duodenum and has a diameter of about three centimeters and a length that can reach 70 centimeters. To make the sausage, the meat is minced finely with the animal’s lard using an electric grinder and seasoned with salt, pepper, sweet paprika, and other spices, depending on the producer’s particular recipe. The sausages are stuffed into casings by hand and cold-smoked over an acacia- or oak-wood fire and are then left to age—ideally for at least two or three months. Traditionally, this cured sausage is eaten in slices accompanied by pickled vegetables such as cucumbers or peppers stuffed with cabbage. The sweet paprika used to season the sausage gives the final product a natural sweetness and a vibrant red color. The Presidium was created to bring attention to a traditional breed of pig, ideal for sausage making due to its excellent and fatty meat. 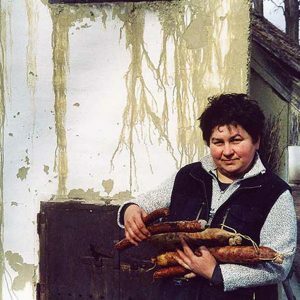 The producers who still make Man- galica sausage are a small, dedicated and well-organized group. The 19 pig farmers have now formed a cooperative and are certified organic. All the producers are found in the Kinkusàg region just south of Budapest at the center of one of the most important national parks in the country. These farmers raise the pigs and produce sausages and hams in-house. They even produce their own paprika to season the sausages. The Presidium is working to help this group promote their product by gradually increas- ing the number of animals raised, and intends to bring together other groups in Hungary who are trying to save this breed. 19 breeders and sausage makers united in the Kiskunsagi Hagyomanyorzo Egyesulet (Kiskunság Tradition-bound Association), all certified organic.